Desert Safari in Rajasthan, with the Grand Tours India provides an exciting and memorable experience that will linger in your mind for a long time. Start your travel through the Thar Desert to visit remote villages and historical remains. 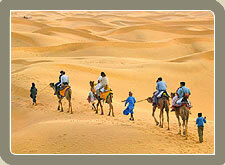 Thar Desert of India lies in Rajasthan, one of the most popular states opulent in culture and glory. In fact, the most magical way to explore the sands of Rajasthan, especially the unending sand dunes of Jaisalmer and Bikaner, is by taking up desert safari. The Desert Safari in Rajasthan will take you to the remotest of the region- Khuri village makes an idle destination. There are also, day treks that leave in the morning and return at night, as well as overnight trips. Grand Tours India offers camel, jeep, and horse safaris and unique tented accommodations as a part of the Desert Safari in Rajasthan package. Desert Safari in Rajasthan Package of Grand Tours India provides you an opportunity to explore the vast sands of the Thar Desert with horse, Jeep and the ship of the desert, i.e., the camel. Desert safari of Rajasthan is a most preferred cruiser, through the medieval cities, forts and palaces of Rajasthan to the most romantic, 12th century Caravan City of Jaisalmer. It is the starting point of the Desert Safari, exploring the vast, unending glittering sand dunes with and addition charm of sighting a Chinkara Antelope, and perhaps even the Great Indian Bustard. Take a camel safari to visit the Rajput villages in the remotest areas of the desert. On Rajasthan Desert Safari, you have an opportunity to explore the vast sands of the Thar Desert with the ship of the desert, i.e., the camel. 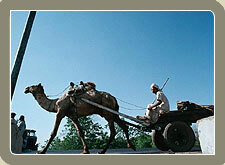 Camel has solved the problem of the people of Rajasthan of covering long and dull routes through the desert. Rajasthan Desert Safari offers number of options to the tourists for camel safaris. You may opt for a short safari through a Rajasthani village or a long safari for a few days passing through the vast expanse of sand. Camel Safari is not easy but is exciting and thrilling. India's Desert Safaris takes back you in time of royal era- an experience to be cherished throughout your life. You will travel to the desert from your pick-up point in a luxury 4- Wheel Drive - a powerful land cruiser. These roller coasters rides known as dune bashing or desert driving, begins their journey, taking you up and down the sand dunes with shriek and laughs with excitement. As the sun submerges into the horizon, it gives a magnificent vista to whole environ- a right time to shoot the golden fire boll with your handy-cam while standing on top of the fading desert dunes. Head towards the campsite where a convoy of camels awaits your arrival for short camel rides. Enjoy barbecue, a buffet dinner beside a glowing bonfire with traditional tea, beneath the gloomy night sky. The additional attraction of the Desert Safari is its cultural show. The camp is lit with oil lamps and echoes with the music from the Manganiyar musicians. Dance performances by local artisans are just breathtaking, with the ever-increasing rhythm of the drums. Dancers, whirling faster and faster around the bonfire are completely a spellbinding sight. These dancers are famous all over the region, as well as outside the countries.